‘Tis the season and whatnot. And since you’re bound to start throwing money out the window any day now, justifying even the most inane purchases by pointing to the calendar, why stop short of your wardrobe this year? Spruce up your look with some cutting-edge metal couture courtesy of Poland’s Godz ov War Productions. I went to their fashion show and assembled the freshest outfits for five different types of fashionable metalheads. Bet you didn’t know there was even one type! 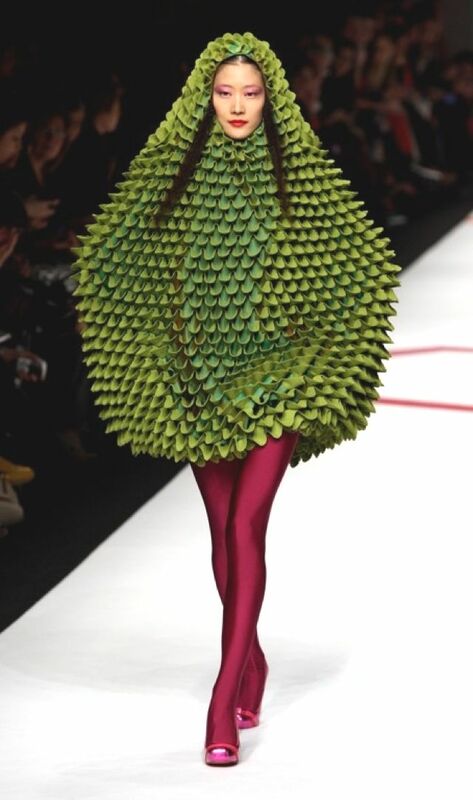 For unfathomable reasons, fashion gets weirder every year. Designers Corpse Garden are no strangers to the business, so they, too, are dishing out something peculiar this year. As opposed to some other examples though, their getup for the daring dandy looks pretty practical. It consists mostly of dissonant riffs, a staple of this kind of avantgarde outfit, but here it’s combined with a bonkers belt-and-suspenders combo made of spry, rumbling, clearly audible bass lines. It’s certainly a looker, and a much-needed re-imagining of the concept of backbone. Underneath, bi-coloured leggings peak out, highlighting a dual vocal approach, one side a guttural reddish purple, the other a more yelling, greenish hue. The understated, dark blouse with the undefinable colour confidently says yes, this is death metal, but that’s no reason to keep the pedal to the metal all day. Why not toss ambient-ish influences into the design in the middle or keep things at a slower boil for long stretches of time, throwing in all sorts of ideas and just letting the madness bubble menacingly. It makes for an enticing composition that bares a closer look to properly take it all in, and for once, I would like to see more of this kind of out-there fashion in the streets. Just don’t call it skronk – that is so 2015. You know it, I know it, Kremlin knows it: some outfits are timeless classics for a reason, and no matter how crazy other designers might get, some folks will always stick to the tried-and-true formulas. Not one season has passed in the last 30 years in which a simple leather jacket of meaty old school riffs was not en vogue, and if it’s worn with as much swagger as in this case, it doesn’t need any fancy accoutrements. Combine that with a Dismember shirt to give it all a voice and you’re pretty much good to go. However, there’s a twist here; opting for boots instead of white hi-tops, donning spiked wrist-bands and adorning the jacket with some studs, Kremlin give it all a dash of sheer aggression, and from some angles, it looks like they’re poised to move things into war metal territory. It’s a risky endeavour, for sure; consumers are growing more and more conscious of where their clothes come from, and many a designer making similar statements has been known to boast questionable ethics. Kremlin certainly make it clear that they are utterly fascinated with conspiracy theories and with violently breaking free of some ruling class or other. Whether they’re serious about it all or just want to make us think about the state of the fashion industry, I can’t really tell. What I can say is they’ve provided us with a fun spin on a vintage style, but since I’ve grown a little paranoid lately, using more opaque fabrics would have been nice. Black is the new black! Anima Damnata are giving us yet another kind of more traditional outfit. This one practically screams “SATAN!” – actually, it does so literally, several times. Their creation is undeniably part of death couture, but it seems woven of that scientifically engineered black fabric (it was only a matter of time until metal designers started using this, really). This makes it clear beyond a doubt that these fellows are beholden to the horned one only. And just like with the blackest black, it’s difficult to really perceive any texture here upon first glance. You might think you’re just as well off wearing your old, faded Vader and Deicide shirts. Not so! Yes, it’s a onesie and might seem basic at first, but a closer look reveals how intricate the mesh really is. Tightly-knit drumming propels the creation ever forward on the catwalk, often going so fast that you might miss the more intricate lacework provided by the guitar. Undoing the zipper reveals surprising splashes of colour in the form of blisteringly bright solos. Add to that an everlasting swirl of guttural vocal emanations and you’ve got an outfit that’s as much at home in a dive bar as it is at a fancy dinner. Say about him what you will, but you can’t deny that Satan is a stylish dude. If your wardrobe sports labels from designers like Asphyx and Incantation, you might be interested in the somewhat more utilitarian fashion made by Rites of Daath. The Nato green canvas that this is made of is so ridiculously heavy and thick that it seems almost impractical at first; it evidently requires several minutes before enough momentum is gathered to actually walk at a normal speed in this outfit. Even then, frequent stops are necessary to catch one’s breath. It feels more like armour than clothing. 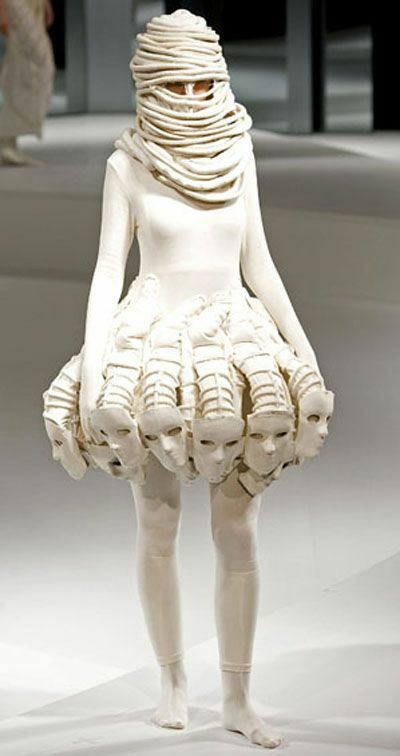 But once you see what this outfit can do, you can’t help but feel impressed. The inside is cleverly laced with riffage that seems to weigh a couple of tons but behaves surprisingly agile once the inertia is overcome. This is achieved by pneumatic components cleverly woven into the fabric that serve for both acceleration and conservation of momentum and sound surprisingly like drums if drums emulated artillery fire. Combine that with the shoes wrapped in tank tread that recklessly crush all minor obstacles and you’ll find yourself single-handedly plowing through crowds, be it at a show or the supermarket. While heavy enough to stop a bullet or twelve, it’s also likely to make you go straight through the wall of your house, so caution is in order. Doom is very much en vogue this year, so much so that two designers decided to take on the topic in a joint effort. What they’ve come up with may not wow you with stylistic surprises, but the outfits are sturdy, reliable, and thick, perfect for keeping you warm during your weed-fueled hibernation period. Shrine of the Serpent came up with a dark grey overcoat and have somehow managed to make this drab colour seem pretty aggressive. 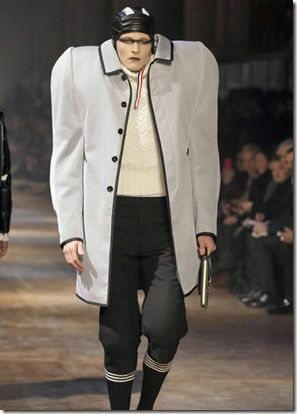 The coat is of a plain design, but so heavy that it’s bound to make you feel like you’re slowly being crushed by it. Its black lining of guttural vocals gives the impression of staring into an abyss, and the piece as a whole makes for an imposing addition to any wardrobe. Unlike with Rites of Daath’s creation, you won’t ever pick up momentum in this thing; it’ll just keep weighing you down. But somehow, there’s comfort in accepting that things will never get better. Black Urn, on the other hand, have given us a slightly more nimble design. These sweat pants will not anchor you on the couch, although they won’t get you out of the house, either. Being a more versatile piece of clothing, however, it’ll at least make you think that you can wear them indoors just as well as while jogging – except you won’t go jogging, of course. I mean look at you, you’re wearing sweat pants. And so the rush of energy subsides again and you slink back to the computer to mellow out. Black Urn get you. They’ve embodied these ups and downs in their design (and even the ups feel aptly drenched in misery). Look, they’ve even stitched a statement about drug abuse into the pants. Looks like Alice In Chain’s “Junkhead”. Guess it’s okay to stay put and smoke another bowl then. Have you found your new favourite outfit? Head over to Facebook and tell Godz ov War how much they’ve enriched your season, or maybe pick a gift for a loved one from their store. Tell them I said something. “The goal was to make it sound more cruel.” An Interview with Loïc of Autokrator and N.K.V.D.